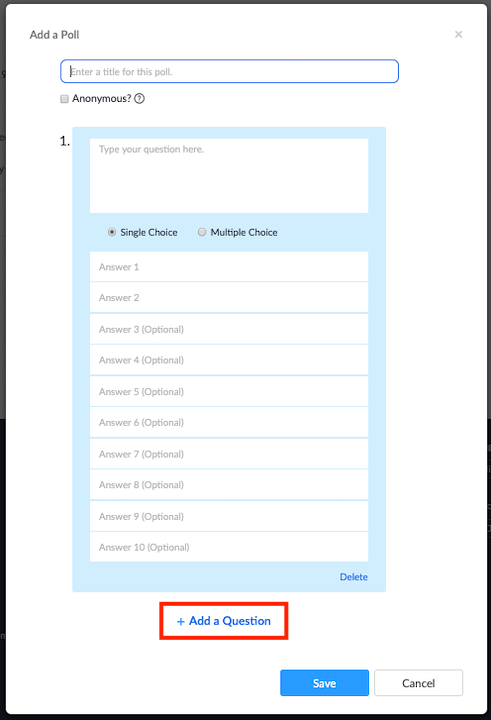 The polling feature for meetings allows you to create multiple choice polling questions for your meetings. You will be able to launch the poll during your meeting and gather the responses from your attendees. You also have the ability to download a report of polling after the meeting. Note: Only the original meeting host can use polling. If host control is transferred to another user, that user will not have polling ability. Sign into the Zoom web portal as an administrator with the privilege to edit Account settings, and click Account Settings. Navigate to the Polling option on the Meeting tab and verify that the setting is enabled. If the setting is disabled, click the Status toggle to enable it. If a verification dialog displays, choose Turn On to verify the change. (Optional) If you want to make this setting mandatory for all users in your account, click the lock icon, and then click Lock to confirm the setting. Sign into the Zoom web portal as an administrator with the privilege to edit User groups, and click Group Management. Click the name of the group, then click the Settings tab. Note: If the option is grayed out, it has been locked at the Account level, and needs to be changed at that level. (Optional) If you want to make this setting mandatory for all users in this group, click the lock icon, and then click Lock to confirm the setting. Sign into the Zoom web portal and click My Meeting Settings (if you are an account administrator) or Meeting Settings (if you are an account member). Note: If the option is grayed out, it has been locked at either the Group or Account level, and you will need to contact your Zoom administrator. Go to My Meetings page and click on your scheduled meeting. If you do not have a scheduled meeting, schedule a meeting now. From the meeting management page, scroll to the bottom to find the Poll option. Click Add to begin creating the poll. Enter a title and your first question. You can mark the question as a single choice or multiple choice question. Type in the answers to your question and click Save at the bottom. If you would like to add a new question, please click Add a Question to create a new question for that particular poll. You can add more polls by repeating Step 2. Note: You can only create a max of 25 polls for a single meeting. Start the scheduled Zoom meeting that has polling enabled. Select the Polling option in the menu bar. Select the poll you would like to launch. The participants in the meeting will now be prompted to answer the polling questions. The host will be able to see the results live. Once you would like to stop the poll, click End Poll. If you would like to share the results to the participants in the meeting, click Share Results. Participants will then see the results of the polling questions. You can download a report of the poll results after the meeting. If registration was turned on, it will list the participants' names and email addresses. If registration was not on, it will show the results, but list the users as "Guest". Adjust the date range so that it includes the date of your meeting. Click Generate for the meeting that you want poll results for. This will take you to the Report Queue page. The report will need to process. When the report is done processing, the page will refresh and a download button will automatically appear. Click Download to download the CSV of your poll results.